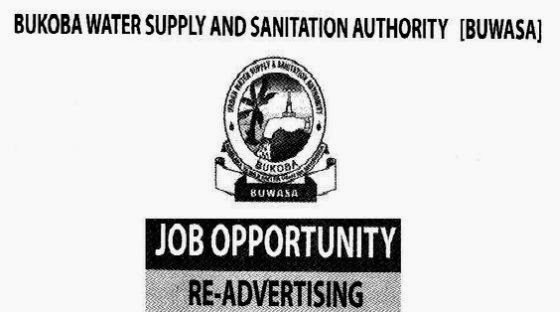 BUWASA is an expanding Autonomous entity which is responsible for supplying of clean and safe water as well as provision of sanitation services for Bukoba Municipality. The Authority is looking for competent, dynamic, energetic, committed, experienced and well qualified Tanzanian who is capable of embracing and driving change in BUWASA to fill the following vacant posts. Bachelor Degree in Supplies and Procurement Management/ Certified Supplies Profession (CSP) or its equivalent and registered with NBMM as Authorized Procurement and Supplies Officer. Three years working experience in similar job is an added advantage. Applicant should not exceed 35 years of Age. 2.Efficient procurement, receiving, inspecting, storage and issue of right materials of the right quality at the right time to the Authority. 3.Clear identification of the materials requirements of the Authority and making timely procurement at minimum cost and with due regard to user specification. 4.Support the functions of Tender Board. 5.Plan the procurement and disposal by tender activities of the procuring entity. 6.Preparing tender documents, tender advertisements and contract documents. 7.Perform any other duties as may be assigned by Managing Director. Remuneration is in accordance with BUWASA Salary Structure and Incentive packages. Applications should be accompanied with Curriculum Vitae, copies of relevant education certificates together with one passport size photo and two names of referees with their contact and postal addresses. Applications should reach the under mentioned address not later than 1st June, 2015. NB:Only shortlisted Candidates will be contacted for the Interview.